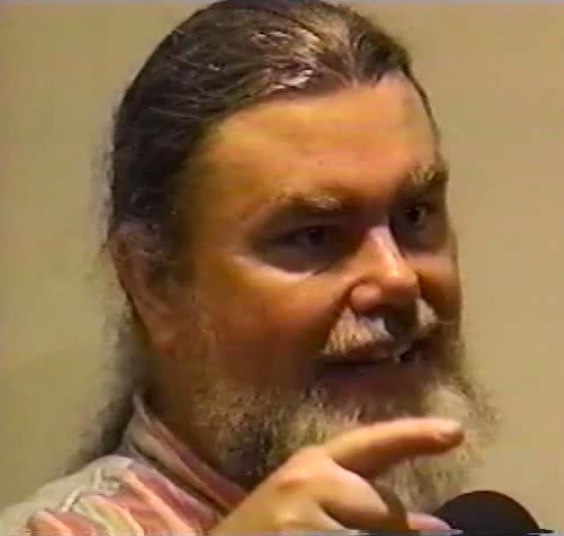 A talk by John Judge in Santa Monica, California, 1996. Video and audio recordings are available at the John Judge 1991 to 2014 Video Archive Listing. The venue for this talk was Deep River Books. John examined the current terrorist acts and their broader implications. Given five years before September 11, this talk has prophetic undertones. Frederick Douglass, “Southern Barbarism,” 24th Anniversary of Emancipation, Washington, DC, 1886 in Philip Foner, ed. The Life and Writings of Frederick Douglass, Vol. 4 (New York: International Pub., 1950), 434. I thought that that was an interesting insight and introduction into the situation that we’re in. I titled the talk tonight, Are You Scared Yet? I did that, despite the fact that Jane Hunter has said, in one interview at least, that my lectures are like drugs in the sixties in that they paralyze people with fear and make them inactive. That’s not anything I’ve ever heard from an audience but it’s what she said about me. I think, in fact, my message, when read properly is more that people should calm down and try to distinguish what they’re being asked, or told, to be afraid of and what they ought to be afraid in reality which is generally hidden from them and the extent to which they ought to be afraid or ought to act instead. I also knew a guy years ago when I worked in the anti-psychiatry movement, John Parkin, who said that he wanted to start a national campaign to abolish paranoia by elevating it to realistic fear. There isn’t a term in the English language that’s the opposite of paranoia, unless it’s just complacency. But there isn’t healthy or realistic fear that maybe somebody is doing something to you. William S. Burroughs said, that paranoia is having all the facts. So I try to get as many as I can, ’cause I’m trying to get there. But my purpose, of course, isn’t to make other people paranoid. My purpose is to hopefully enlighten people about what’s happening around them and what they ought to be putting their focus on. Charlie Manson said, paranoia is heightened awareness. Michael McClure said that even paranoids have enemies. I know I have some. But I don’t spend my life looking over my shoulder, I try to look in front of me and see what’s coming. I found a quote this year. A friend of mine, Wendy Govier, works with Adobe up in Palo Alto and her boss has an extant copy of the Bill of Rights so he put it up and digitized it onto the web so people could download the Bill of Rights. She asked me to get some background. I found a quote from Thomas Jefferson about the Bill of Rights and the Constitution. After he read the Constitution that had been proposed; he was in France at the time because they got the real radical people out of the country as quickly as they could. He got a look at it and he said “I [will] now add what I do not like.” This was about the Constitution. First, the omission of a bill of rights providing clearly and without the aid of sophisms for freedom of religion, freedom of the press, protection against standing armies, restriction against monopolies, the eternal and unremitting force of haebeus corpus laws, and trails by jury in all matters of fact, trail by the laws of the land not the law of nations. Let me add that a bill of rights is what the people are entitled to against every government on Earth, general or particular, and what no just government should refuse, or rest on inference. So they were actually unable to get state ratification of the Constitution as they wrote it without putting in at least the early Bill of Rights and since then of course different ammendments have expanded the idea of rights. I think that it should be seen as a dynamic thing, not a sacralized text that’s frozen in history because the only way it’s really preserved is hermetically sealed there at the National Archives. It’s only preserved in terms of a conceptualization by the action of people in the time in which it is. Our task is the same as Jefferson’s task was in his era. He was of course blind to things that we now see. Who knows, three hundred years from now how people will laugh at our conception of liberation and interaction, should we last so long. It’s our duty, I think, to define our liberation in our own time. And to move in that direction on behalf of not only ourselves but any kind of future that we want to have for people that come after us. Historian Howard Zinn pointed out in his book, Declarations of Independence, that to depend on the simple existence of a Bill of Rights as a guarantee of our freedom is to risk liberty and life itself. Only two decades ago, U.S. citizens refused to sign a copy of the Bill of Rights on public streets claiming that the ideas in it were Communistic. So it needs not so much to be preserved as reprinted and distributed. It’s not taken very seriously except by the people who want to use it for their own purposes. And I included on the flyer tonight also one quote by Ben Franklin who said that those who would surrender liberty for security deserve neither. I think that’s really the themes of what I’m wanting to talk about. It has been classic within governments, at least in the 19th and 20th centuries, and probably earlier but we don’t have as good a history, to use what are known now as provocateurs. The function of a provocateur for the government or the ruling class or the state is to infiltrate opposition groups and then encourage within those groups violence or reaction against the state which can then be used in turn by the state as it’s excuse for repressing the group. So you provoke a response.